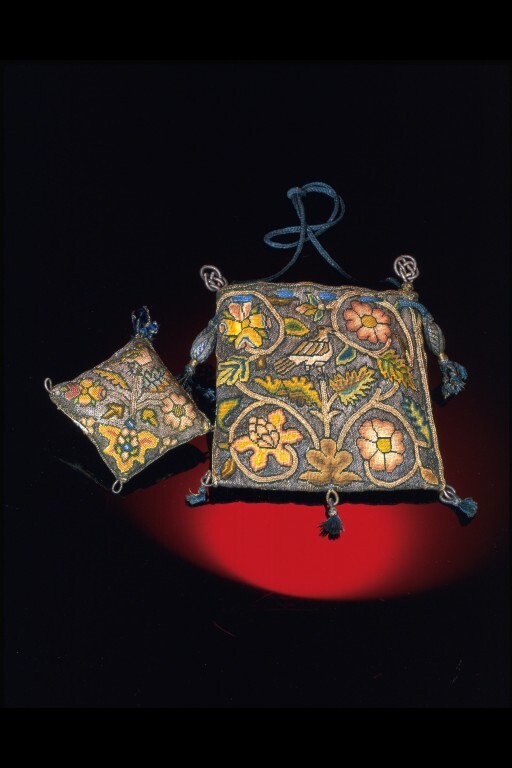 In the 17th century decorative purses such as this one were rarely used to carry money. Their wealthy owners engaged in few commercial exchanges requiring cash although embroidered bags were sometimes used as 'gift wrapping' for a gift of coin. Some served as 'sweet bags', filled with dried flowers or scented powder, to perfume clothing and deter moth. The attachment of a pincushion to this purse suggests that it might have been used as a sewing kit. An X-ray of the pincushion reveals a needle, lost in its depths. Both are made of an even, plain-weave linen, which has been completely covered with silk floss, silver-gilt and silver file threads. These are stitched over every intersection of the warp and weft, in tent stitch and single-stage stitch, covering the ground. This form of decoration, was also used on furnishings such as curtains, bed hangings, table carpets, chairs and cushion covers. The decoration of this purse and pincushion is identical to a knife case with two knives, T.55-1954, acquired at the same time, and all three may have been made as a set. Seventeenth-century inventories often list purses, knives and pincushions together, indicating that these were essential accessories for both men and women. 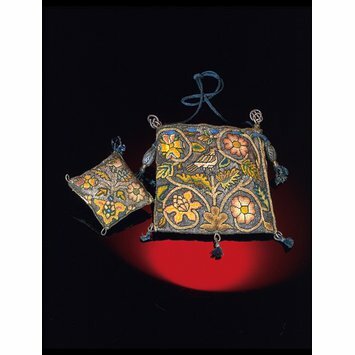 Purse and pincushion embroidered with silver and coloured silks in tent stitch and silver-gilt thread in double-plait stitch. The embroidery design includes a bird, rose, grapes and vine leaf and a pansy. Both purse and pincushion have drawstrings of blue silk and silver, finger-looped braid; the purse has silver-strip-wrapped thread knots and blue silk and silver-gilt finials. The purse is lined with blue silk. Bequeathed by Sir Frederick Richmond, Bart. in 1954, with a collection of 17th century embroidery and accessories. Decoration and details are identical to T.55&A&B-1954, a knife case with 2 knives, and probably made as a set. 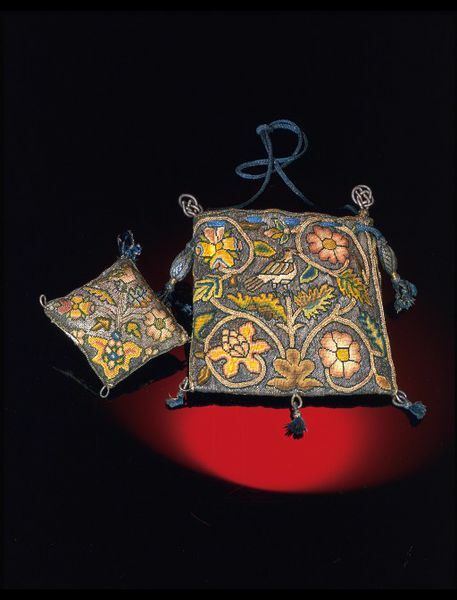 Small decorative bags or purses were used to carry small tools and accessories such as mirrors. The matching of a pincushion with this example, suggests it was used for sewing tools.